For those who say Lee Jong Suk cannot act, open your eyes juseyo. I’m not his fan nor I support him (because of his scandal) nor I’ve never liked him as an actor (ok, I admit I fell for him on IHYV but he’s easily being forgotten) but I know that he can act. Not on Yoo Ah In, Ji Chang Wook level but not on acting-dol level. He’s decent. Okay, by mentioning acting-dol level is a bit too much, sorry. Lee Jong Suk might not appeal to everyone (my friends and some others) but he’s a decent actor. Park Shin Hye’s acting has improved everyone!!! And no more awkward kissing scene, YAY! I don’t know but I’m just happy that she’s getting better in acting –and getting prettier too-. All actors did very great. They were perfect for the role given to them. The pilot ep was boring. I don’t know about you guys but the first quarter of the drama was boring. Their high school days was fun to watch but their childhood story was damn boring. The story picked up after In Ha and Dal Po both accepted to become journalist and it was fun, their early days as a journalist was fun to watch. Then the story got deeper and deeper as Dal Po’s biological brother came out and made such ruckus (murdered people). Then they gave us Manager Song’s (In Ha’s mother) dark scandal that brought us to Seo Bum Jo’s mother’s mess. Once again, drama taught us that people who have power are ridiculously scary. I have a friend who is a reporter too, but she seems really enjoying her job even though she has to go here and there, battling against Jakarta awesome heat and Jakarta awesome pollution. But Pinocchio taught me that being a reporter is not an easy thing to do. This drama taught me greater understanding of news reporters’ job and how important their work is. Mass media is really a powerful tool to influence people. It’s really scary when bad people use mass media to divert attention from them (when/if these bad people make a mistake) by paying medias to do this and that like Seo Bum Jo’s mom’s case). In k-ent it’s called “Media Play”. And it’s also scary how reporter’s one mistake, even though it’s really small, might ruin one’s life, like fireman Ki’s case. 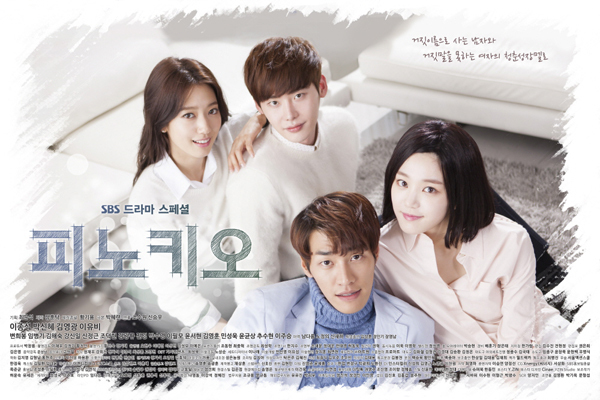 I usually hate a lot of extra characters since most of the time, they’re totally useless *cough* the heirs *cough*, but all of the characters in Pinocchio add to the story and not eyesore to watch. For example, Yoo Rae and Cap Hwang, that guy who lead the anti-cap-Hwang ‘organization’ with the female cameramen. I might get tons of hate, but I don’t get emotionally involved with this drama or its characters. The plot on the second half was great, I could not find any holes in the story line and of course the acting from each of the cast was great too, but from ep 1-21 but I couldn’t get emotionally involved with what was Dal Po and In Ha going through. I was just watching. And…. Watching, yeah I just watched the show and forget it the next second. Don’t get me wrong. The BGM fit the scenes and drama but the songs as individuals (forgetting the fact that they are OST) none of them catch my attention, all 15 tracks. I rate the OST based on the possibility of how often I would listen to it in my spare time. Maybe these songs are great fit for the drama but I won’t listen to these tracks in the future. But if you want to download the OST you can download it here. Will I Watch it Again? YESH!! !